She'd first invited me to dinner in 97. I was fresh to Mumbai. Homesick. Living in a PG. My first Durga Pujo alone. Oh Calcutta was Only Fish. 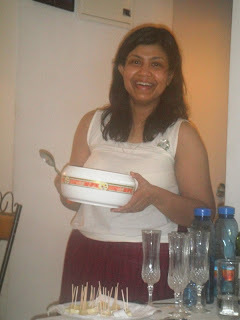 She'd invited me to Shorshe Ilsish (Hilsa in mustard sauce) from Only Calcutta at their place on the last day of the Pujos. Exhaustion. A bad stomach. I could not make it to the invite. Years went by. We changed jobs. Moved into different worlds. Lives changed. And then we connected again through Facebook. This time as friends and not as office colleagues. To say that she is not 'into' food would be an understatement. She doesn't share our passion for red meat, carbs, cheese, chocolates, spirits and everything that bad boys like. She is a Bong who wakes up and jumps onto a treadmill, loves South Indian vegetarian food, detoxes, eats her fruits, vegetables and whole grains and does everything we don't. And yet we connect on food! Especially on our pet theory that food is not just about the food. So we have dined together, eaten out together, exchanged stories and books on food...one who loves to eat, another who loves the world of food. So what do we get when we go to dinner at such a person's house? Our non food 'eater' travels all the way from Bhakti Park to Bandra to shop for us. Pork momos are made knowing our love for pork. Even though she doesn't touch the meat herself. Chicken momos which pork lovers like Kainaz and me tripped over. Cheese platter to break the taste. A remarkable spread of very different cheeses. Rohu roe fry or 'caviare' as our posse of Bongs put it. And then when you thought dinner is over, when you have stuffed yourself with more momos than even the Dalai Lama could possibly eat, out comes the Ilish, a bit like Amitabh Bachchan who made an entry in the second half of Geraftar. Rice and posto baata. Some like Kainaz fell by the wayside but others like Soumik and I batted on.For me it was a tryst with Ilish which was fulfilled after thirteen years. Topped by an amazing tomato chutney which Shunanda Mashi made and sent through Happy Fork. Each bite reminding me of the heady days of Durga Puja of my growing up years and the community lunches in our building. If food can bring alive memories then this chutney or chaatnee was right up there. And tasted fantastic too. And when we were rolling on the floor whimpering in joy (figuratively), out came Mumbaiyya mangoes in cream as a fitting finale. Yes all this by a lady who is not 'into eating'. But who kept spinning from plate to plate refilling them earnestly and meticulously. You know you are with a great host when the food keeps flowing. As do the conversations. When guests make connections. And discover old connections. When everyone is happy. Smiling. Content and full. A dazed smile on our faces. Relaxed and stretched. Completely at home. Thank you Madhumita for the wonderful night and the wonderful time. I doubt if Archies Cards can ever beat this. Note: There are no photos yet but my Cyber Shot would seem like a humble Walther PPK versus Rana's Bazooka like camera. Happy Fork took some snaps too and lent them to me. Shunandamashi says "Thanks a million!"